Now that it has been quite a time using Edge, you may notice that there is a deep drop down in the performance of the utility. On top of that, many functions do not launch and work properly. 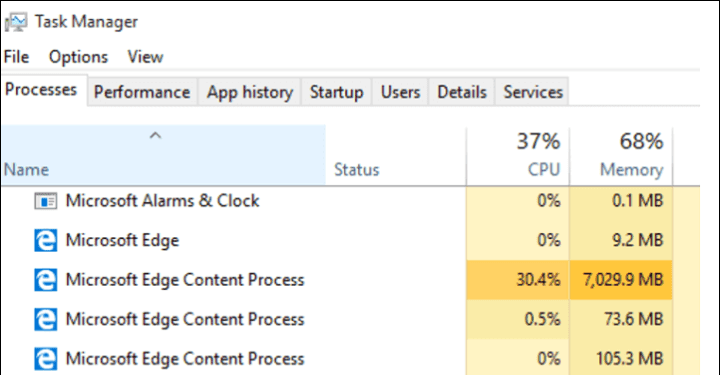 When checking for it in the Task Manager, it is seen that there is a huge amount of memory getting consumed by Microsoft Edge. As per the users, Microsoft Edge Content Process utilize around 1 gigabyte of RAM. But, you cannot disable this in the Task Manager since without it you cannot work with. Suppose by mistake you kill the process with multiple tabs on Edge, few web pages may get close and stop performing.